Translation : Mrs. Peggy Davis, revised by R. Triquet. Origin: Western Mediterranean basin, development : Cuba. Date of publication of the official Valid Standard: 04.11.2008. General appearance : The Havanese is a sturdy little dog, low on his legs, with long abundant hair, soft and preferably wavy. His movement is lively and elastic. Important proportions : The length of the muzzle (tip of nose to stop) is equal to the distance between the stop and the occipital protuberance. The relation between the length of the body (measured from the point of the shoulder to the point of the buttock) and the height at the withers is of 4/3. Behaviour / temperament : Exceptionally bright he is easy to train as alarm dog. Affectionate, of a happy nature, he is amiable, a charmer, playful and even a bit of a clown. He loves children and plays endlessly with them. Head : Of medium length, the relation between the length of the head and that of the trunk (measured from the withers to the base of the tail) is of 3/7. Skull : Flat to very slightly rounded, broad; forehead hardly rising; seen from above it is rounded at the back and almost straight and square on the other three sides. Nose : Black or brown. Muzzle : Narrowing progressively and slightly towards the nose but neither snipey nor truncated. Lips : Fine, lean, tight. Jaws/Teeth : Scissor bite. A complete dentition is desirable. The absence of premolars 1 (PM1) and molars 3 (M3) is tolerated. Cheeks : Very flat, not prominent. Eyes : Quite big, almond shape, of brown colour as dark as possible. Kind expression. The eyes rims must be dark brown to black. Ears : Set relatively high; they fall along the cheeks forming a discreet fold which raises them slightly. Their extremity is in a lightly rounded point. They are covered with hair in long fringes. Neither propeller ears (sticking sideways), nor stuck to the cheeks. Neck : Of medium length. Body : The length of the body is slightly superior to that of the height at the withers. Back : Topline straight, slightly arched over the loin. Belly (abdomen) : Well tucked up. Tail : Carried high, either in shape of a crozier or preferably rolled over the back; it is furnished with feathering of long silky hair. Forequarters : Forelegs straight and parallel, lean; good bone structure. The distance from the ground to the elbow must not be greater than that between the elbow and the withers. Hindquarters : Good bone structure; moderate angulations. Feet : Of slightly elongated shape; small; tight toes. 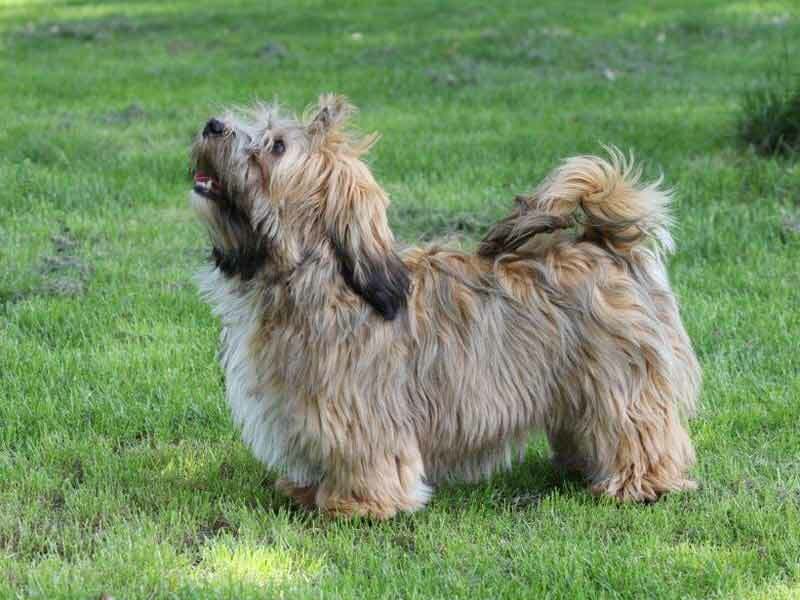 Gait / movement : According to his happy nature, the Havanese has a strikingly light-footed and elastic gait; forelegs with free stride and pointing straight forward, the hindlegs giving them the impulsion and moving in a straight line. Hair : Undercoat woolly and not very developed; it is often totally absent. The topcoat is very long (12-18 cm in an adult dog), soft, flat or wavy and may form curly strands. All grooming, the usage of scissors to even out the length of the coat and all trimming is forbidden. Exception : tidying up the hair on the feet is permitted, the hair on the forehead may be slightly shortened so that it does not cover the eyes and the hair on the muzzle may be slightly tidied up, but it is preferable to leave it in natural length. Rarely completely pure white, fawn in its different shades (slight blackened overlay admitted), black, havana-brown, tobacco colour, reddish-brown. Patches in mentioned colours allowed. Tan markings in all nuances permitted. Height at the withers : From 23 to 27 cm. Tolerance : from 21 to 29 cm. General appearance lacking in type. Truncated or snipey muzzle, length not identical to that of the skull. Bird of prey eyes; eyes too deep set or prominent; rims of eyelids partially depigmented. Body too long or too short. Straight tail, not carried high. « French » front (pasterns too close, feet turned outwards). Coat harsh, not abundant; hair short except on puppies; groomed coat. Ectropion, entropion; rim of eyelids of one or both eyes depigmented. Size over or under the indicated norms of the standard. Only functionally and clinically healthy dogs, with breed typical conformation should be used for breeding. The latest amendments are in bold characters.